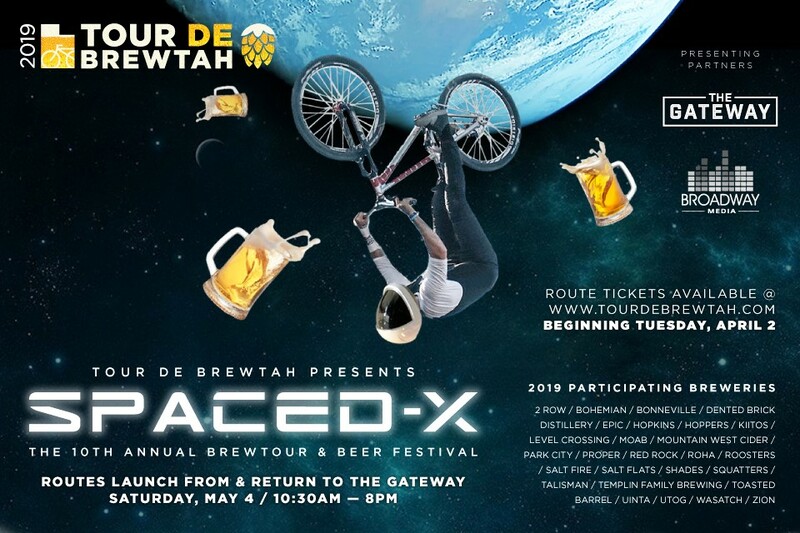 Join us as we celebrate the 10th anniversary of Tour De Brewtah on Saturday May 4th, 2019 at The Gateway. Our theme this year is “SPACED-X”, so prepare to journey with us into the depths of Utah’s finest brewed cosmic matter. This year we launch from Mission Control at The Gateway to voyage out & around Salt Lake’s finest breweries by bike. Complete your orbit by touching down safely back at Gateway Plaza, where we are proud to present our first-ever Tour De Brewtah Local Beer Festival, which runs noon to 8 pm around the fountains at Mission Control. Festival admission is free—and all-ages are welcome—so even if you don’t make the ride we welcome you to come explore everything our Utah Beer Galaxy has to offer… there will be plenty for both adults and their little astronauts to discover. Tour De Brewtah Route tickets will go on sale April 2nd, 2019. For more info click here!